this points to a particular object. Now, which is that object is depends on how a function which includes 'this' keyword is being called. Look at the following example and guess what the result would be? The following four rules applies to this in order to know which object is referred by this keyword. 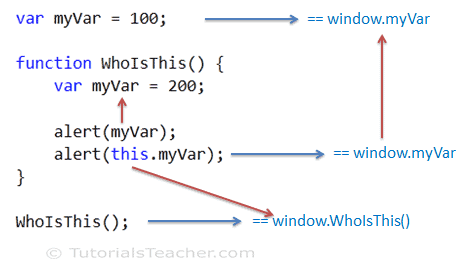 If a function which includes 'this' keyword, is called from the global scope then this will point to the window object. Learn about global and local scope here. In the above example, a function WhoIsThis() is being called from the global scope. The global scope means in the context of window object. We can optionally call it like window.WhoIsThis(). So in the above example, this keyword in WhoIsThis() function will refer to window object. So, this.myVar will return 100. However, if you access myVar without this then it will refer to local myVar variable defined in WhoIsThis() function. The following figure illustrates the above example. In the strict mode, value of 'this' will be undefined in the global scope. 'this' points to global window object even if it is used in an inner function. Consider the following example. So, if 'this' is used inside any global function and called without dot notation or using window. then this will refer to global object which is default window object. As you have learned here, you can create an object of a function using new keyword. So, when you create an object of a function using new keyword then this will point to that particular object. Consider the following example. In the above example, obj will have two properties myVar and display, where display is a function expression. So, this inside display() method points to obj when calling obj.display(). this behaves the same way when object created using object literal, as shown below. In the above example, WhoIsThis(), WhoIsThis.call() and WhoIsThis.apply() executes a function in the same way. The main purpose of call() and apply() is to set the context of this inside a function irrespective whether that function is being called in the global scope or as object's method. You can pass an object as a first parameter in call() and apply() to which the this inside a calling function should point to. The following example demonstrates the call() & apply(). As you can see in the above example, when the function WhoIsThis is called using () operator (like WhoIsThis()) then this inside a function follows the rule- refers to window object. However, when the WhoIsThis is called using call() and apply() method then this refers to an object which is passed as a first parameter irrespective of how the function is being called. The bind() method was introduced since ECMAScript 5. It can be used to set the context of 'this' to a specified object when a function is invoked. The bind() method is usually helpful in setting up the context of this for a callback function. Consider the following example. So these 4 rules applies to this keyword in order to determine which object this refers to. The following is precedence of order. So, first check whether a function is being called as callback function using bind()? If not then check whether a function is being called using call() or apply() with parmeter? If not then check whether a function is being called as an object function? Otherise check whether a function is being called in the global scope without dot notation or using window object. Thus, use these simple rules in order to know which object the 'this' refers to inside any function.